Over the past two weeks, authorities in multiple countries have arrested smugglers and seized major shipments of illegal wildlife products in Africa and Asia, including rhino horn, elephant ivory and pangolin scales. The largest such seizure occurred earlier this week in Singapore, where an estimated $6 million in ivory tusks, rhino horn and teeth believed to be from cheetahs and leopards were found stashed in a shipping container filled with bags of tea leaves. In each of these six separate cases, the shipments were en route to Vietnam and/or China, or involved smuggling by nationals of those countries. With its status symbol allure and alleged medicinal properties, rhino horn is a luxury item in Vietnam, a primary market for horn that’s driving the slaughter of rhinos in Africa. That’s why in 2014, WildAid and our conservation partners launched “Stop Using Rhino Horn," a three-year campaign with support and cooperation from the government as well as business leaders and media partners, who have contributed $1.6 million in donated media that has reached millions of consumers. On Friday, WildAid’s Vietnam team welcomed actor Maggie Q, star of the hit CBS TV series "Stalker," and Deputy Chief of Mission of the U.S. Embassy Claire A. Pierangelo to a launch event in Hanoi for the second year of Stop Using Rhino Horn, which now boasts over 40 Vietnamese celebrities spreading this important message. A precipitous spike in rhino and elephant poaching has dominated environmental news headlines in recent weeks, with record numbers of rhinos killed in South Africa last year and sting operations in multiple African nations uncovering elephant ivory bound for Asian markets. But look closer at the coverage, and you may also read about one obscure animal equally imperiled by the illegal wildlife trade — and a fraction the physical size of these megafauna. Chinese police have seized hundreds of bear paws and dead pangolins smuggled into China where they are prized as an expensive culinary delicacy with uses in traditional medicine. Police made 20 arrests in a smuggling ring in the south-western province of Yunnan, seizing 278 bear paws and 416 pangolins which had been brought in by lorry or train from Yunnan to three neighbouring provinces between December and January this year, according to a report in the Yunnan Daily. 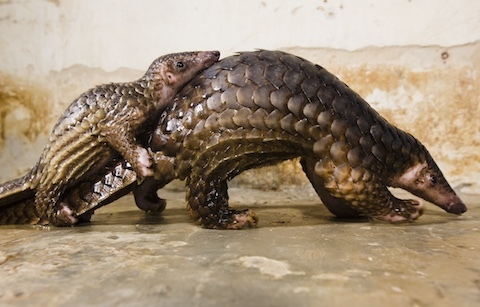 The pangolins, which resemble armadillos, had been injected with tranquillisers to keep them quiet.